The fourteenth AerospaceLab Journal issue is dedicated to aeroelasticity and structural dynamics. Aeroelasticity can be briefly defined as the study of the low frequency dynamic behavior of a structure (aircraft, turbomachine, helicopter rotor, etc.) in an aerodynamic flow. It focuses on the interactions between, on the one hand, the static or vibrational deformations of the structure and, on the other hand, the modifications or fluctuations of the aerodynamic flow field. Aeroelastic phenomena have a strong influence on stability and therefore on the integrity of aeronautical structures, as well as on their performance and durability. In the current context, in which a reduction of the footprint of aeronautics on the environment is sought, in particular by reducing the mass and fuel consumption of aircraft, aeroelasticity problems must be taken into account as early as possible in the design of such structures, whether they are conventional or innovative concepts. It is therefore necessary to develop increasingly efficient and accurate numerical and experimental methods and tools, allowing additional complex physical phenomena to be taken into account. On the other hand, the development of larger and lighter aeronautical structures entails the need to determine the dynamic characteristics of such highly flexible structures, taking into account their possibly non-linear behavior (large displacements, for example), and optimizing them by, for example, taking advantage of the particular properties of new materials (in particular, composite materials). This issue of AerospaceLab Journal presents the current situation regarding numerical calculation and simulation methods specific to aeroelasticity and structural dynamics for several applications: fan damping computation and flutter prediction, static and dynamic aeroelasticity of aircraft and gust response. 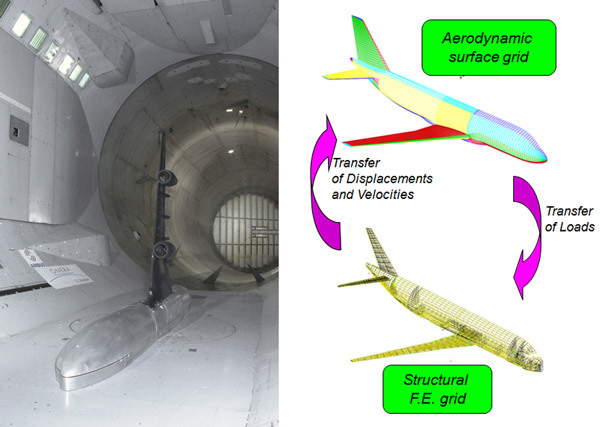 Moreover, articles present results on smart morphing structures for airplanes. Other papers present the latest progress in terms of structure design and critical load assessment. Finally, articles present recent results relating to structural damping modelling and the non-linear behavior of structural assemblies, to the development of structure optimization algorithms taking into account uncertainties, to the development of vibration control devices and to the crashworthiness of aeronautical composite structures.